Practically every Halloween season will see the media be all over the paranormal. Whether that is through an increase in articles in a published work (newspapers), on television, with more movies than usual or a sudden rise in public ghost hunts, the choices are not limited. The big question some folks may have is which of these is the best to participate in or to experience some thrills? Television networks believe having a special during this time is fashionable. When programs like Ghost Wars and Ghosted are two new entries, this genre will not fade away anytime soon. Not only has interest in the spiritual world become part of the pop culture scene — beyond comic books, fiction and film — the wonder of why some folks want to investigate these haunted places now than at any other time come into question. Not every one will do so, but to have this influx from media out to provide content this season like clockwork feels problematical. A bit of technique can be learned, but this medium is not always ideal to get an education. Maybe some bits of history about a famous location will be gleaned, but they are never as good as mentoring with experienced investigators or staying in a library to read case studies from respected investigators. In the print front, Harry Price‘s journals (from 1922 to 1946) make for a fascinating look when this hobby was in its infancy. Although many of his ideas and techniques have been criticized, there’s no denying he was one of the early pioneers to make records of occult activities. After Harry Houdini’s mother died, the famed magician hoped to make spirit contact with her and sadly found most mediums are frauds. He made a point of debunking spirit activity and those who claim to have a connection with the other side. Another author’s works which come through as credible are the books by investigative journalist Brad Steiger. In the video front, there are not many documentaries which stand out. Most are designed to inform instead of draw conclusions, television included. There is a handful of “news-style” programming which takes the subject seriously, like Sightings with Tim White as the newscaster from the 90’s, Mystery Hunters designed for youths to enjoy in 2002 and Paranormal Zone with Phng Li Kim reporting on the strange goings-on on SyFy Asia (broadcasting 2016-present). One decent documentary is The Castle Project: Colorado’s Haunted Mansion. But to understand why these programs often capture the public interest simply boils down to the fact that nearly all of us love to hear a good ghost story (by the campfire or not). The earliest known work dates to approximately 50 A.D. with Pliny the Younger writing about a ghost bound in chains. Stories continued to be told, and Shakespeare helped popularize their role in an entertainment medium. Hamlet is perhaps the most well-known play in English Literature (considered a tragedy than ghost-story) since this title character had to interact with his dead father. In MacBeth, a murdered king made his return as a shade. Just what a spirit represents in a story versus real life will vary. They often require the living to help the dead finish a goal. They do not want to be forgotten. Perhaps a bit of this applies to actual hauntings too. Recent interpretations of what they mean outside of the paranormal realm include a study from Canadian filmmaker Guy Maddin. He expanded on the texture of what a lost film means. He produced Séances for the National Film Board of Canada. This interactive installation art piece — where the goal is to project images trapped in celluloid into a free-floating space — is made to give life to those people seemingly lost to time. Patrons to this exhibit found this serenade a fitting tribute to what encountering a ghost may be like. He also made the movie Keyhole, which nails what being haunted by means. But when comparing any movie or documentary (on television or not) to proper treatises on the subject of the paranormal, the main purpose of these shows is to entertain viewers than to provide facts. Many paranormal investigators do not watch these programs since they never offer anything new that they do not already know. When they do, it is for fun. If there’s a technique or piece of equipment being pioneered, it will be discussed at online forums. Sometimes, a haunting is residual (time has a strange way to record and replay odd times of human history) or random, which is a rarity. Not many programs and the people who star in them are interested in helping the living deal with the undead. Some series tend to show some affected individuals fighting it, but when the force cannot be stopped, they end result is the same: they move out. Other shows, like The Dead Files, try to offer solace but Amy Allan (the show’s psychic) doesn’t put forth enough effort and Steve Dischiavi (the detective) is more about searching for the facts. John Zaffis is a respected name in the community but curiously, he fell into the let’s make a television series trap and starred in the series called Haunted Collector. It was watchable and it only lasted for three seasons. To note, Zaffis is the nephew of Ed and Lorraine Warren. These two investigators popularized the Amityville Haunting and their works inspired the Conjuring film franchise. More often than not, all these programs are banking on a shtick to sell to the masses. Ghost Hunters began by telling the world that Grant Wilson and Jason Hawes are plumbers by day and investigators at night. After a successful early run, Wilson eventually quit to pursue other interests and interestingly, Hawes still works for this company. After ten successful years on TV, the people who go out to investigate has changed. Some were fired, others have quit (for one reason or another), and there are those who prefer to be out of the spotlight. Accusations have been made about fakery. Even older programs like Paranormal State has been scrutinized. Ghost Adventures is just as bad and the show still going on strong on Travel Channel. The leader of the group, Zak Bagans, has been under deeper scrutiny for his alleged skulduggery. This program has always had a machismo attitude in the paranormal battlefield. Since then, many other programs have appeared which emphasizes oddball or hot looking personalities to sell a concept (like Deep South Paranormal, Long Island Medium, Ghost in the Hood or Haunted Towns). A lot of these shows make the life of a paranormal investigator seem fashionably cool when it’s not. There’s nothing wrong with the on-air personalities projecting an image (one humourist noted how everyone loves to wear black) as long as his or her behaviour does not overshadow the sincerity of what the investigative group does. Long nights make for a tired team. What’s seen is a pared down four to a six-hour investigation, and not every location can give definitive results overnight. Another category of programs are the paranormal news-style dramas. Some include dramatizations with actors in the place of the affected. The people who experienced the haunting usually provide the voice-over. The big question is if we are supposed to believe in shows like Celebrity Ghost Stories (2009-2014) when these people are trained actors? 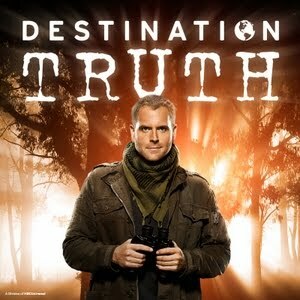 Programs like Destination Truth fit into a weird niche as they are more instilled with humour than seriousness. These type of programs, including all the reality type shows, have a cult following. They are all made to be entertaining than to enlighten. Audiences never get to hear any definitive conclusions and most viewers are not tuning in to find answers with Josh Gates. They just want to see what his next crazy shenanigan is going to be. This program concluded and Gates is wanting to show to the world he’s serious with archaeological style adventures in Expedition Unknown. In some investigations, joking around surprisingly helps create an energy for spirits to float on. They can feed upon it in order to help them respond during an investigation. Perhaps that’s why some series are better than others because the directors and video editors know what to put on TV. Although the entertainment media often skews the goings on in favour of pizzazz in their portrayal on-screen, the bigger question is if these programs, fictional or not, are satisfying to watch? They are fun for some, but for others, it eventually all becomes a monotonous bore since there has never been any proof-positive revelations. Nothing has shaken the world. During the Halloween season, everyone is more about sharing the boo’s than seeing it as a boon.